I'm Here. I'm Queer. What the Hell do I read? : I'm Interviewed on the ONE BAD MOTHER podcast! 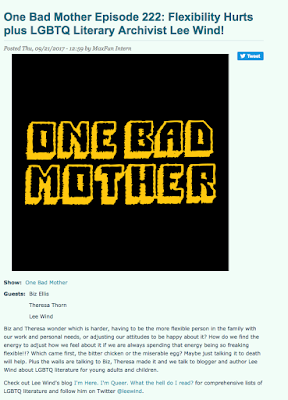 I'm Interviewed on the ONE BAD MOTHER podcast! Biz and Theresa are funny, and share so honestly about the trials and triumphs of being parents - and I'm really honored to be the featured guest on their latest episode (#222), "Flexibility Hurts plus LGBTQ Literary Archivist Lee Wind"